Located on the North-Western shores of magical Zanzibar, at Nungwi, La Gemma Dell Est Hotel is an enchanting, luxurious and environmental friendly Resort Development was designed and constructed to melt with its magnificent surroundings and the marvelous contours of the landscape set in the midst of exotic and colorful tropical gardens and waterfalls inviting to enjoy the pristine and relaxing view over the Indian Ocean. 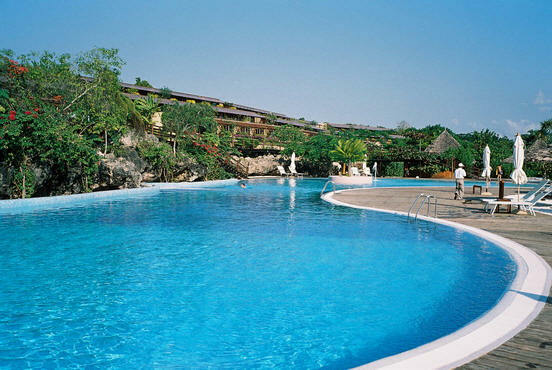 La Gemma Dell Est Hotel Zanzibar is located 50 km from the airport. Stone Town, the Island Capital is just a mere 55 minutes drive passing rural villages through the intriguing countryside. Rates all inclusive of meals, soft drinks, local beers, juices, water, tea, coffee served in main restaurant. All meals served buffet style. Children Discount- I child 0-11 years 100%, Extra Child at 50% of adult sharing rate. Coral Cove, Al fresco pizzeria on the beach serves fresh pizza, salads, aperitif, selected wine and refreshing drinks. Open for dinner only. The "Lobby Lounge & Bar" is located near the Reception offering refreshing drinks in a calm and peaceful environment during the day and early evening. The "Sea Breeze" a la carte restaurant, fresh seafood cooked and served to perfection in exceptional and romantic atmosphere. The"Caf� Moresco" oriental coffee and tea, water-pipe, oriental snacks and pastries. La Gemma Dell Est Hotel Zanzibar has an international dive center, Padi, Water-sport center a large swimming pool with children area and fitness centre with gym, jacuzzi. Activities include Hobby cat, windsurfing, Laser dinghy, and caneing.